6 LB serves APPROX 50-75 people. 6 Lb minimum to operate fountain. Sephra Premium Milk couture chocolate contains 33% of cocoa solids. This is our original specially formulated couture chocolate developed for use by commercial chocolate fountain operators and for home use chocolate fountains. Made in the USA from all natural ingredients and kosher certified, it contains no hydrogenated oils or substituted vegetable fats. Sephra Premium Chocolate is the premier gourmet chocolate for use in chocolate fountains. 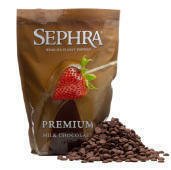 Sephra's Premium chocolate fountain chocolate is packaged in 2 lb. bags for convenient portion control and for better product shelf life. You will be amazed at the difference in taste!